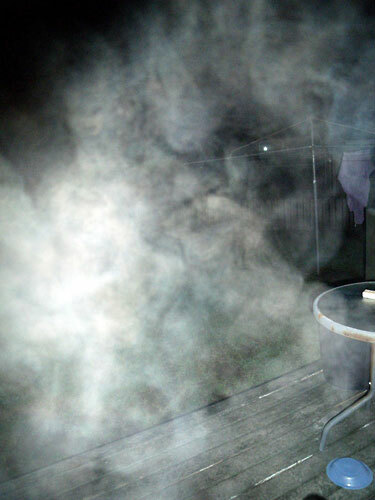 Strange mists appearing in photographs have been linked with spirits and ghosts, and more recently, with ectoplasm! The concept of ectoplasm comes from the Victorian age, when Spiritualism was very popular (rife, if you like) and it was thought that spirits must materialise from something other than thin air. The word Ectoplasm was coined from Greek by Charles Richet c.1894. More recently, the films Ghostbusters and Ghostbusters II re-popularised the stuff. 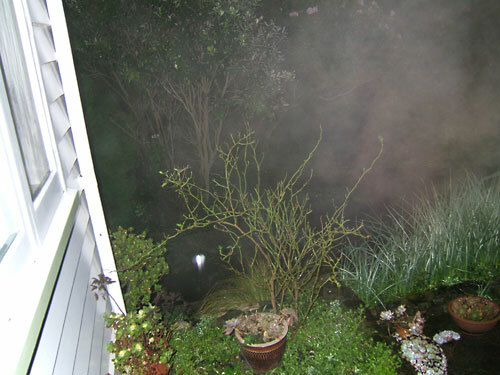 We think that the mists - or ectoplasm - appearing in these photos is most likely the photographer's breath, or cigarette smoke, illuminated by the camera flash. However, we can't be 100% sure. it's up to you to decide for yourself: ghostly materialisation or something more mundane? We're not entirely sure what has caused this mist. No one was smoking, and it wasn't cold enough for breath to mist up - visible to the eye anyway - but the camera flash may still have caught Rob's breath, somehow. when a gully-ite dies, that their ashes are scattered in this area. reclamation in the late nineteenth-early twentieth centuries). We have also recently heard a story about a massacre that happened in the bush here in the early part of the 19th century, in the so called Musket Wars, where a number of Maori (around 20) were killed. This resulted in a tapu being placed upon the area. We have yet to corroborate this information. The sender of this curious photo asked if it could be "ectoplasm". 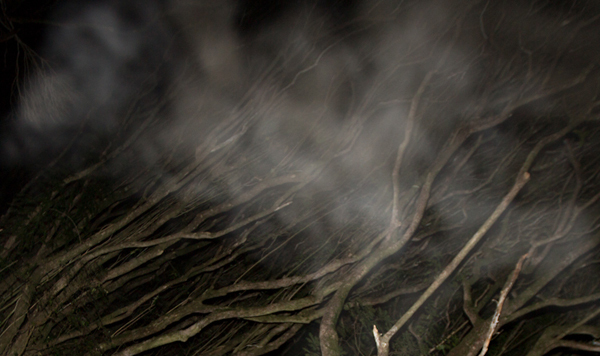 Well, this word has come back into fashion for describing strange mists such as this that appear in photos. Often the mist cannot be seen except in the photo. Ectoplasm was a term used in Victorian times, during the craze on mediumship, to describe the substance that spirits would materialise from. Some fraudulent mediums used to spew out things like lengths of cheesecloth, which, in the dim light, would appear as a kind of substantial vapour. Once again, we think this is the effect of apophenia, (matrixing, or pareidolia) - the tendency of our brains to see order in random shapes. 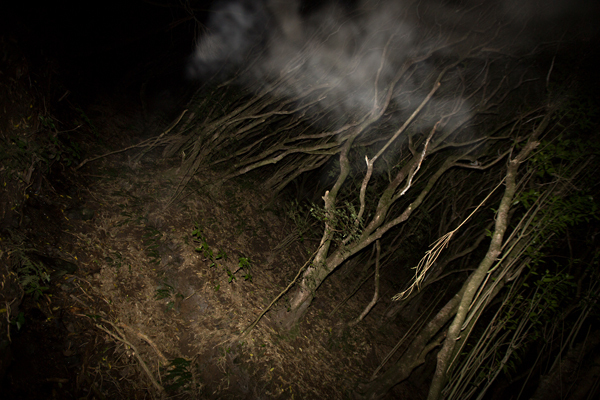 We suspect the mist is caused by the photographer's breath coming round in front of the flash and reflecting back into the lens. Our photo on the right is not as spectacular as the one sent in but shows a similar effect. If you want to avoid this effect in your photos in cool conditions, take care not to exhale before taking the shot. Close-up (100%) of light in our photo, above. 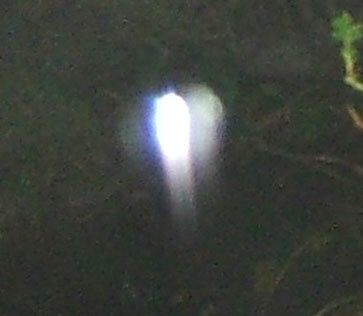 We think this is a moisture drop passing close to the camera, caught by the flash. The trail moving up probably to do with the way the flash works in relation to the shutter timing. If you want to try recreating this, go out and try taking some photos in the rain with flash. The effect varies between camera models, though. Camera mode: Action, Flash mode: auto. Flash fired at full power. Our photo was taken on a Fuji Finepix 810, standard auto mode with auto flash.